Spiritual Evolution of the Bean: Drawing with a Fountain Pen : Which pens do you perfer to draw with? Drawing with a Fountain Pen : Which pens do you perfer to draw with? This morning I noticed that people were arriving at my blog after searching for the term "Drawing with a Lamy 2000." While I write an awful lot, I also draw as often as possible. In my experience, I've found that firmer nibbed fountain pens are easier for drawing than those that have some level of flex. This being said, I found that my Pelikan M200 and Lamy 2000 weren't the best pens I've tried to draw with. I like to use my Lamy Safari's for drawing and doodling. I feel that the firm nibs allow for more control and flow - and the notched grip seems to help maintain control of the pen as well. I suppose this is one of those "YMMV" (your mileage may vary) types of situations, because I'm sure that there are many different kinds of fountain pens that people enjoy drawing with. 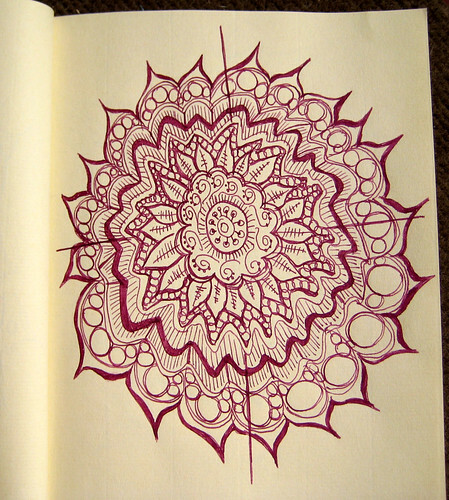 Another mandala drawn with a Lamy Safari. Nib is a custom .05 Cursive Italic ground by Pendemonium. Ink is Private Reserve's Arabian Rose. Any fine point that flows sufficiently well will do though. The fine point Waterman Edson is great. Old hard rubber Watermans from the 1920 too. I have a Pelikan with a custom extra-extra-fine point that is really fun to use. It needs the right ink though, otherwise the result is too light. Private Reserver Velvet Black or Aurora Black are my favorites. Esterbrook J with a 9128 (semi-flexible) nib here. Also have used an old hard rubber Waterman 12 1/2 eyedropper with a more flexible nib. The Esterbrook, however, is less expensive to replace should anything happen to it. The first fountain pen I used to draw was a cheap Sheaffer cartridge pen that I got at a drugstore in the early 90s. I still have it. I've seen lots of positive blog & message board posts about the Safari, though. I know this is an old post, but I was just wondering, can you get much variation in line width from the Lamy Safari? I usually use a dip pen for inking drawings/comics and was looking for something similar that's more portable (fineliners are too fixed-width.) I know that I probably won't get the flexibility from a fountain pen but how does the Safari/others compare to fixed width pens? You could say that the Safari's also have a fixed width, unless you get one of their Italic nibs, or have someone like Pendimonium make you a Cursive Italic.... Safari's have no flex to their nibs. Most modern FP's lack flex, but you can find some vintage pens with flex. Hope that helps. I've been writing about drawing with fountain pens at my blog. If you know anything about the pen in this post, I would love to know. I am not familiar with the Rotring pen you are talking about - but I did go to your page and answer your question about nibs, etc. PS - Check out jetoens.com for Japanese fountain pens.